US Ambassador David Friedman expected to join thousands in mass prayer event at Western Wall ahead of Rosh Hashanna. 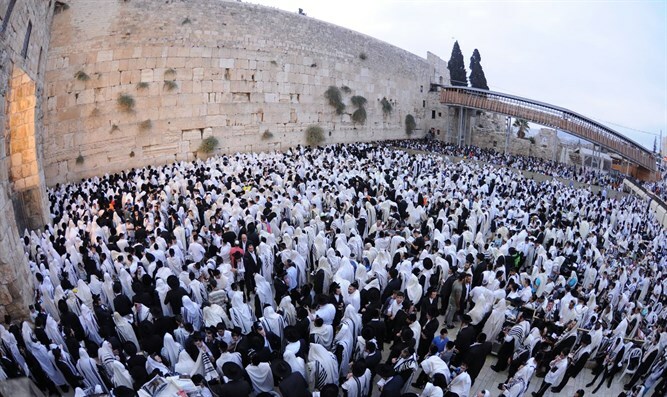 More than 10,000 people are expected to pray at the Western Wall in the Old City of Jerusalem this Friday, September 7th, for the Day of Jewish Unity organized by Acheinu, the outreach arm of the NGO 'Dirshu'. There are plans for U.S. Ambassador to Israel, David Friedman to join participants at the Western Wall praying for unity among Jews and for a peaceful, less divisive world. According to Rabbi Shlomo Rozenstein of Dirshu, the crowd at the Western Wall might reach 15,000 people this year, which is the fourth consecutive year that Acheinu has planned this event that has worldwide reach. Many non-Jews in the United States have endorsed this day of prayer publicly including former Arkansas Governor Mike Huckabee, financier Anthony Scaramucci, and TV commentators, Noelle Nikpour, Danielle McLaughlin, Esq. and Lee Carter. Each year Acheinu chooses this day in correspondence with the yahrzeit of the Chofetz Chaim, also known as Rabbi Israel Meir Kagan. The Chofetz Chaim, who passed away in 1933 wrote the Sefer Chafetz Chaim to organize and clarify the laws regarding evil talk and gossip. He was also the author of Shmirat HaLashon, and the Mishnah Brurah. For the Day of Jewish Unity, Jews are being asked to read two passages of psalms, chapter 20 and 130 between 7 am and 2 pm. Schools, businesses and many thousands of individuals across the world will be taking part in the prayer event.